Branching out to a native desktop app beyond Quip's existing offerings on the web, iOS and Android provides a number of benefits for users, most notably support for editing files offline. Once a user logs into Quip Desktop, the app will download all of their files locally so they're available for use offline. When a user logs back on, their changes will sync with the copy that's stored on Quip's server, and propagate out to anyone else who might have the same document shared with them. Users who need to collaborate on shared documents with other people will be able to see where their colleagues are editing in real time and send messages back and forth within the app, just like they can on the web or through Quip's mobile apps. Quip Desktop also offers push notifications, so people will see when they get a new document shared with them, or when another user sends them a message inside Quip. Mac users get a few extra goodies when they install the application, since it works with Apple's Spotlight search feature to pull up their personal documents and all of the documents shared with them. It also works with Apple's Handoff feature, so people can pass a document back and forth between their Mac, iPhone and iPad. The service launched two years ago with an iPhone, iPad and web app that only handled collaborative word processing. Since then, the company, which was founded by former Facebook CTO Bret Taylor and Google App Engine creator Kevin Gibbs, added support for spreadsheets as well as Android devices. In June, roughly half of all daily usage of Quip took place through its desktop website, up from 20 percent when Quip was first introduced two years ago. The growth stems from increased use at work, Quip said in a blog post. The company works with more than 30,000 businesses, including high-profile clients like Facebook, CNN, Instacart, Al Jazeera and Wealthfront. 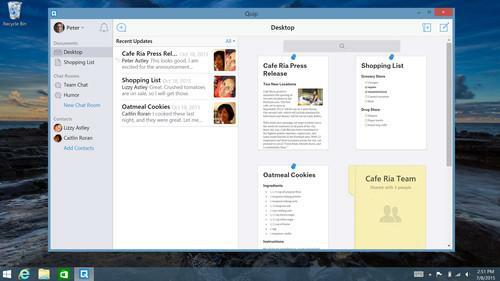 Quip's new app is another swing at Microsoft Office's dominance of the productivity suite market. In a post to Medium discussing his company's development efforts, Taylor claimed the app can open documents faster than both Word for the Mac and Google Docs. It's the Google comparison that may serve Quip better, at least in the short run, since it's also free for personal use, like Google Drive. The news comes as Microsoft is gearing up for the next major release of its Office suite later this year. Office 2016 will bring online collaboration tools to Microsoft's desktop productivity apps so that users of those applications can work together on shared documents as well.